they were all paid for through the florist and not rented or borrowed from our venue. We have been keeping them in our Office/Craft room ever since then. SOOOOO what to do with all these vases?!?!?! I (of course) searched Pinterest for ideas and inspiration, and felt a bit overwhelmed not knowing where in the house I could put it and find a home for, but I realized I didn’t need to make them all the same or use them all at once. I could make them seasonal or even get more creative and give them away as gifts. 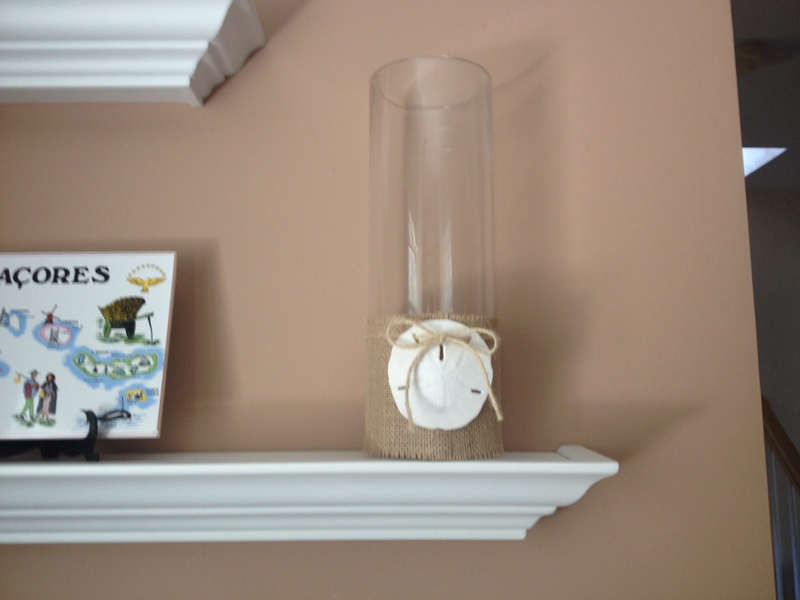 So here I go starting with one at a time……… today for DIY Friday we are doing a beach theme vase. 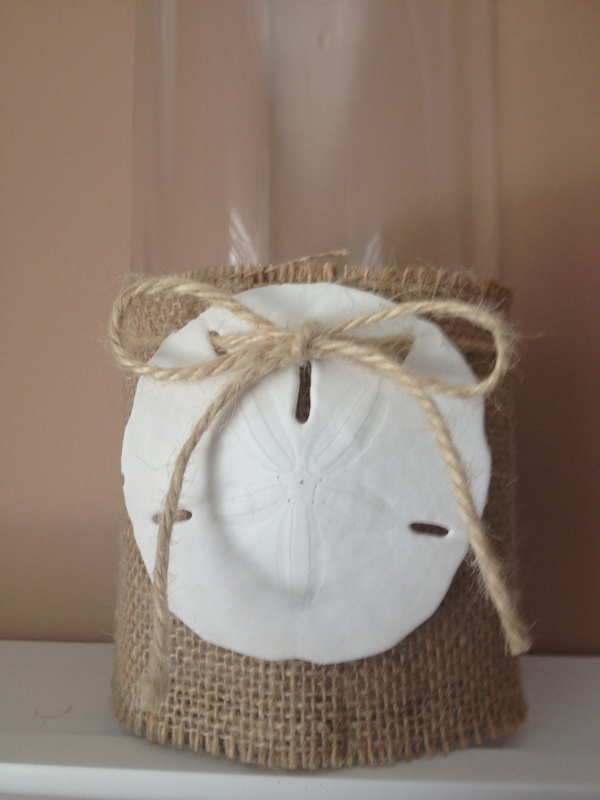 Sand Dollar & Burlap! As you can see I have 3 different sizes and plenty of each of them, so for this one I just chose the medium size. 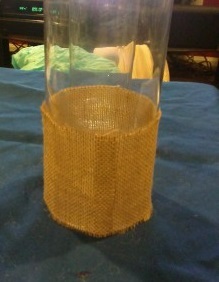 I wrapped a wider burlap ribbon tightly around the vase and cut it accordingly leaving a little overlap to glue the seam; that way your not gluing all over the vase. I used E6000 industrial craft glue. This takes a bit to dry but will dry clear, and I had tied some twine a could times around it to hold the seam closed while it dried. Then I just simply fed the twine through the sand dollar and carefully tied it into a bow! And Voila!! The first of many more soon to come! So cute! This turned out great thanks for sharing 🙂 I want to try it for our beach u bathroom! I’m just curious- where did you get those cute white shelves? Thanks for checking out my posts! Glad you like them. I believe it was on clearance at Kohl’s a few years back, I’m not sure if they still sell them.